So, from now until 9/30/13 at 11:59 pm, get 15% off of all Nail Fabulosity nail polishes at Nail Fabulosity. Just enter coupon code HAIRSCAPADES at checkout (excludes S&H) to get 15% off of as many polishes as you’d like (1 for you, 1 for your sister, 1 for your bestie, 1 for your curlfriend, and so on and so on ;)!!)!! And don’t forget to check out Rece’s natural hair exploits over at A Hair Story!! Okay, I am not a nail polish person. I loved the gel polishes a few years back … until they thoroughly destroyed my nails for MONTHS due to the chiseling required to remove the polish. And as it relates to regular polish, I have several complaints. One, I have no interest in waiting for nail polish to dry. So, two, I usually mess at least one nail up before it does. And three, even if I don’t, it starts chipping and peeling in less than 24 hours. And, four, I am not reapplying another layer of polish a day, because it goes back to waiting for it to dry. So, why then did I break down on Tuesday and got a mani with my normal monthly summer pedi? Well, ecause it’s only $25 for both on Mon-Wed at my normal spot and I really liked my Minions yellow nails that I did for the Warrior Dash!! Well, my issues were proven. I dinged a nail slightly once I got home and it wasn’t totally dried hard. And, by the next morning … nails chipping and peeling already. And today? Wrecked!! Grrrrrr Arrrggghh!! Anywho, all this to say, I posted a pic of my nails and got some advice on things to do to get nail polish to stick. Gelous Nail Gel from Sally’s as a base coat, bringing my own polish since they use thinner in the bottles at the salon, and/or using a gel top coat sealed with the UV light. With those potential solutions in hand when I saw my girl Rece, of A Hair Story, post about her new nail polish line, Nail Fabulosity, and then saw her thermal nail polishes … my ambivalence about nail polish waned. I sooooo want to try these!!! To learn more about Nail Fabulosity and Rece’s formaldehyde, dibutyl phthalate (DBP), toluen, formaldehyde resin, and camphor free polishes, and learn where you can buy them, check out her post above!! Oh, and check out this review of the Nail Fabulosity thermal polish, Butterfly Kisses (a pink/purple), by my other curlfriend, Michelle of Radiant Brown Beauty. Have you tried thermal nail polishes? What’s the verdict? What’s been consuming my time? 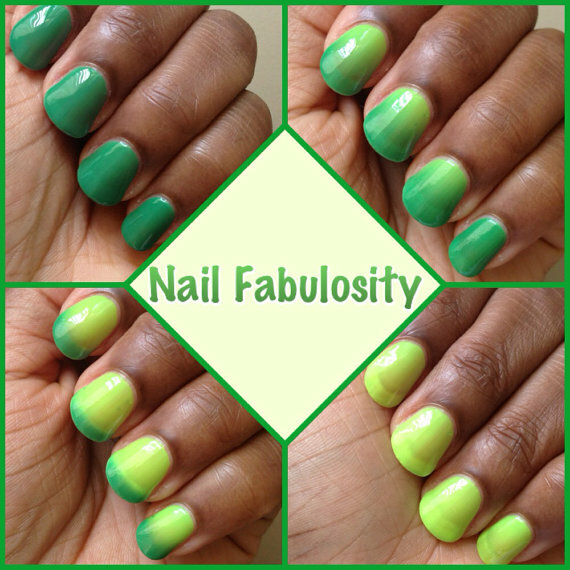 A little over a month ago, I started my own line of nail polishes called Nail Fabulosity. I am currently selling on Etsy at NailFabulosity.Etsy.com. I create unique hand blended nail polishes that are 5-free and cruelty free. 5-free means that they’re free of the toxins formaldehyde, dibutyl phthalate (DBP), toluene, formaldehyde resin and camphor. Cruelty free means they’re never tested on animals. Some polishes are glitter polishes, some are thermal and change color based on temperature (my personal favorite) and some are holographic nail polishes. I create custom order nail polishes if you have something special in mind. I create custom orders as favors for events such as baby showers, bridal showers and birthdays. So if you know the bride to be is a pink girl, I will create a lovely, unique pink polish as favors for her bridal shower.